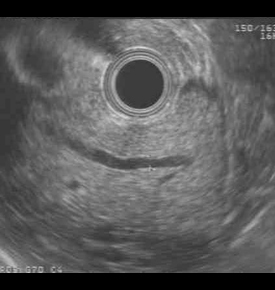 Over the past two years many institutions have implemented the combined functional EUS test. There has been multiple peer-to-peer medical journal articles related to EUS-EPFT (please see the publication section). (Right) EUS imaging identifying the pancreatic ducts and anatomy. It is an exciting new procedure that combines the “gold standard” Secretin stimulation test to evaluate pancreas function with the highly flexible imaging by endoscopic ultrasound (EUS) procedure. 1.Imaging of the pancreas resting prior to stimulation. 2.Dynamic imaging of the pancreas after Secretin stimulation. 3.Development of before and after stimulation anatomic parameters that may be used to provide additional diagnostic insights in pancreas disease. 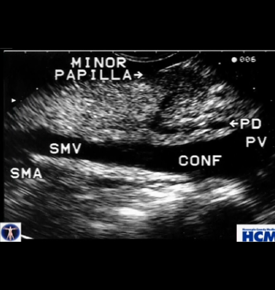 4.Monitor pancreatic fluid flow directly and visually to evaluate ductal compliance. 5.Provide easy access to samples of pancreatic fluid for electrolytes, e.g. HCO3 as well as cytokines, chemokines, and genetic end marker assays. 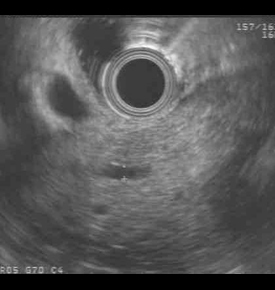 6.You are able to get visual pictures of the pancreas and ductal structures with EUS and quantitative measurement of the pancreas with Secretin stimulation from the pancreatic fluid andbicarbonate. This combined procedure will assist you in your diagnosis for early Chronic Pancreatitis or exocrine pancreas dysfunction. Combine two billable procedures into one procedure time and bill for both procedures. The entire procedure takes about an hour. Twenty (20) minutes for EUS and 45 minutes for ePFT. Collection times for ePFT are 15, 30, and 45 mins. 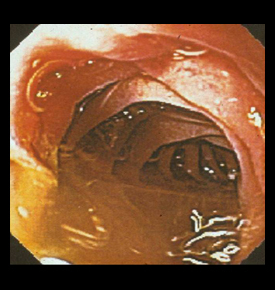 You can inject ChiRhoStim® (Human Secretin) near the beginning for the EUS procedure and do your visual inspection of the pancreas (Secretin can dilate the duct while you are performing the EUS). When it is time to collect the first 15 min sample, just aspirate the fluid from the duodenum and then go back to finishing your EUS. Leave the scope down until you collect the 30 and 45 min samples. PFT is the most sensitive in detecting early CP. Human Secretin J-code 2850, Pancreatic function test CPT codes 43757. Please visit the Ordering page for more information and links to the AMA website.